First, ask yourself: Am I a Good Cookie? By nature most oatmeal cookies come with one unfortunate ingredient: raisins. I like raisins, by themselves, in a box. But not in my baked goods. Cranberries, however, are a different story. Obviously I need to cook with Craisins more often. Beat butter/margarine on medium with an electric mixer until creamy, gradually add sugars. Add egg and vanilla, beating until blended. Combine flour, soda, powder, and salt and then add to the sugar mixture, beating until blended. Stir in cranberries, pecans and oats. Drop dough onto lightly greased cookie sheet (I used a silicone baking mat instead), 2 inches a part. Bake for 9 minutes (Colorado time). After the first batch, I put the dough in the fridge for a bit so that the cookies didn't spread quite as much. The fancy holiday touch: I used some white candy coating to dip the majority of the cookies. You just warm the coating in the microwave and stir until smooth. Dip half the cookie into the coating and let cool on wax paper. What's With the Good Cookie? Two OXO employees who had a child with cancer started Cookies for Kids Cancer . It provides inspiration, ideas and support for people everywhere to help fight pediatric cancer - through the simple concept of local bake sales. All over the country individuals and organizations host bake sales, with the proceeds going to Cookies for Kids Cancer to help fund more research for pediatric cancer. 1. Send a virtual cookie. No calories and no guilt. OXO will make a donation for each e-cookie sent, up to 10,000 cookies per week. 2. Find a bake sale near you and eat your way through it. 3. Host a bake sale. 4. Host a cookie exchange. Glad will donate $0.10 per cookie exchanged or sold this December as a part of their Glad to Give program. 5. A second no-calorie option: Make a financial gift online. 6. 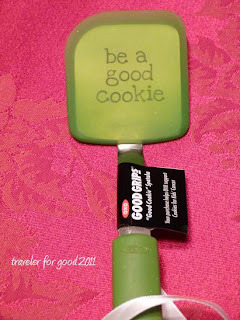 Buy the OXO limited edition Good Cookie spatula. The good people at OXO gave me two spatulas for free as a part of the OXO Blogger Outreach Database. 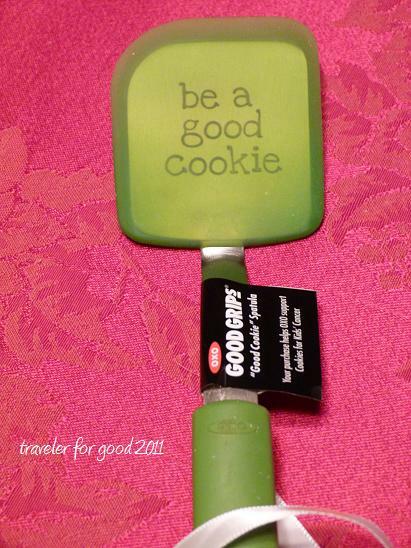 One of the Good Cookie spatulas was to use for my own Colorado baking adventures. It makes me smile every time I see it. Every cookie is a good cookie. There is a second one for you! Simply post in the comments your favorite Christmas / December treat. It doesn't have to be a cookie. It doesn't even have to be sweet. Just what it is and who makes it (or where you can buy it). I will choose a winner using random.org on Friday December 16, so make sure you comment by Thursday. Anyone can post, but I am limited to shipping the spatula in the US. You may even have your spatula before Christmas depending on how fast FedEx Ground moves and how far away you live. Let your inner Good Cookie shine! Obviously, cookies ARE my favorite holiday treat. On Sunday, I made Russian cookies called Khvorost (twigs): 2 eggs, 1/2 tbl spoon rum or vodka or whiskey or baileys, a drizzle of vanilla. You beat eggs until they are thick and creamy and add booze and vanilla. 1 3/4 cups of flour mixed with 1/4 cup sugar and a pinch of salt. Mix into these dried ingredients 1 tablespoon of softened butter, creating crumbly mixture. Then combine with wet ingredients and knead to create a soft dough. You can roll it out and cut into shapes with cookie cutters. Then you deep fry them for just 1 minute each. They will brown pretty fast. And they will be super crunchy, because booze dries them out. Then, you drizzle them with some powdered sugar and voila! Great cookie! 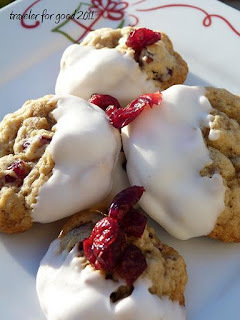 My hubby's favorite is the oatmeal raisin but I bet we would both love these! Thanks for making people of aware of Bake a Difference. I'm going to go check out all of the ways to help. My favorite December/Christmas treat is a Mexican dessert called buñuelos, so yummy! In a large bowl, mix flour, baking powder and salt.In a small bowl, beat one tbsp sugar, eggs and butter. Stir in milk. Add milk mixture to flour. If dough is too dry, add a few more drops of milk. Knead dough until it is very smooth. Shape into 20 balls. Cover and let stand for 30 minutes.Heat oil one-inch deep in large skillet to 360 F.Roll each ball out on a lightly-floured board into very thin six-inch circle. Fry buñuelos until golden brown, turning once. Drain on absorbent towels. Sprinkle with sugar-cinnamon topping while warm, or drizzle with brown sugar syrup. Here's the recipe. I must give credit to Pillsbury. Liberally butter 3 or 4 cookie sheets. Set them on a protected surface. In a large saucepan, combine sugar, corn syrup and water. Add peanuts and salt. Cook to hard-crack stage (300 degrees F), stirring frequently. Pour mixture onto prepared cookie sheets. With the back of a clean fork or spoon, push down any peanuts that are piled up. When the outermost 1/8 inch of the candy is slightly firm, begin pulling the edges of the candy with a fork, thereby making the candy thinner. Work around all the edges quickly. Then go back and start cutting. As the candy just begins to cool, lift the edges with your fork and cut off sections – large or small – with a pair of scissors. Set them on a clean surface or turn them over on the buttered cookie sheets to finish cooling. It makes me smile to read your blog and find new yummy recipes to try! My favorite Christmas treat is gingerbread cookies. Andy and I have made them every year since we started dating...we haven't had the chance yet this year, but are looking forward to it in the upcoming week! Snickerdoodle cookies are Christmas to me. My mom would make them from the OLD Betty Crocker cookbook and that was 51 yrs ago. May be old but STILL a friends and family favorite. Not only do I love baking my Nana's Sugar Cookies, I love eating them! Thank you all for sharing! Congrats Stephanie, you are the winner. Send me your address at travelerforgood (at) gmail (dot) com and I'll ship it out.